This web site was created and is maintained by a home owner on the CHG built residential development known as Malibu Beach, Oliva Nova, Espana (the initial phase completed May 2004 with phase 2 being completed in 2006). His interest is to maintain a well coordinated and communicative community for the benefit of each other for everyone who has an interest (financial, lifestyle or otherwise) in the residence. All too often communities like ours fail or break down over time simply due to lack of communication. 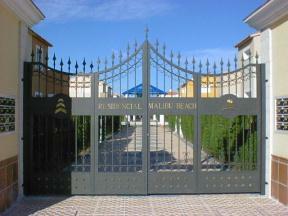 1 - Information about the Oliva Nova complex and the Malibu Beach community of around 60 villas. This should be a useful resource for all owners and their guests wanting to get the best out of their stay. 2 - It is also a forum for us all to communicate, discuss matters of common interest, express worries or desires so that we help each other if possible & we can all pull together in the right direction for the common good of maintaining & improving our community. Although we employ a CHG residence Agent and we have a formal Residential committee, the opportunity for us all to communicate directly with each other in a wider sense can be restricted. Issues such as security, repairs, restaurant recommendations, good value shops, beach bar opening times etc. can be severely limited so this web site is meant to be another way of communicating. Most natural communication with each other normally happens when we slowly begin to meet & chat around the pool for example & this web site is merely an extension of the friendly ‘pool side’ chat opportunity. This web site does not seek to override or influence any formal decisions about our community taken by our Agents or the formal residence committee. Should you have any queries or problems, please do not hesitate to contact the administrator (click here). Constructive comments or suggestions are always welcomed.